The Big Blue Haus, so popular it has its own Facebook page. The Big Blue Haus on 9th Avenue in Oakland has been home to a community of Bay Area queers and artists for decades. Even though the last signs of blue paint on the late 19th-century mansion faded to gray years ago, the building east of Lake Merritt has so many fans that residents have created their own Facebook page, which boasts more than 400 followers. 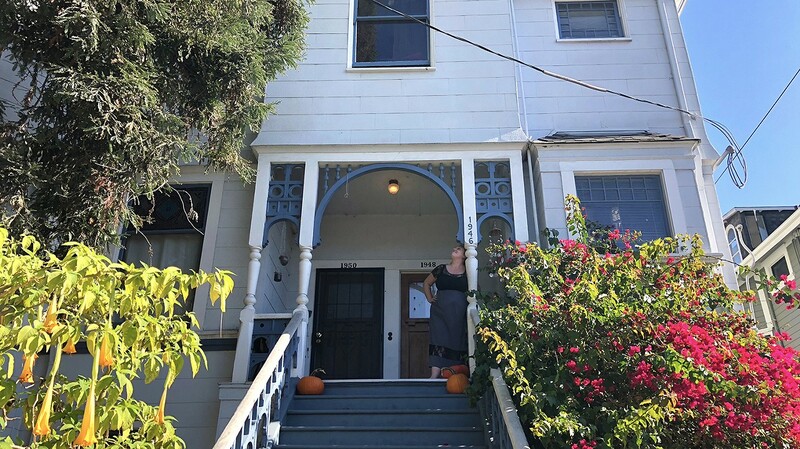 "It­'s full of the folks who are still keeping art alive in the Bay," said Whitney Moses, a resident who described the house as having wainscoting as tall as she is and a reputation for backyard concerts. "It's like a queer little haven." But that haven is threatened. The house has a new owner, local executive and Airbnb host E.J. Blumberg. In July, he paid just under a million for the property, according to Redfin. In September, he served the eight residents with eviction papers, citing the Ellis Act, a state law that allows him to evict the residents of all four rent-controlled units if he takes the building off the rental market. Eviction would mean the end of a long line. Over the years, tenants have passed their leases on to members of a tight-knit community. Ten-year resident Tina Sogliuzzo, 35, a seamstress and performance artist who goes by the name of Ruby Vixenn, took over her lease from a friend. For Vixenn, leaving The Big Blue Haus could mean having to leave the Bay Area. Starting again in today's pricey rental market isn't an option for most artists, especially one with student loans. "My entire life and business is based on being a creative artist in the Bay Area," she said, as she bent over her vintage Sears Kenmore sewing machine working on a costume for an upcoming performance. "He came to each apartment individually and told us all the same thing: that he intended to get us all out," said Vixenn, referring to the new owner, Blumberg. "He offered me less than $20K and basically says, 'I'm going to do so much construction you will have to move.'" Jessie Vanciel, who has lived in the house since 2004, had a similar story. "It's been an amazing 15 years," he said, tearing up. "He came down to my kitchen and said that if I moved out sooner rather than later, he would offer me more money." Vanciel, who is recovering from back surgery, declined Blumberg's offer. Walking gingerly to let his dogs outside, Vanciel patted the cold walls of the hallway connecting his apartment to the shared backyard. "He said he was going to turn the place into an Airbnb and because I lived in the basement I had to be the first to go — to do foundation work." If Blumberg were to list the house on a rental site, he would be breaching the terms of the Ellis Act, which prevents landlords from renting the property for a period of time after eviction. Blumberg denied telling anyone that he would turn the home into an Airbnb — although Moses, Vixenn, and Vanciel each say he did. "It most definitely won't be an Airbnb," the Piedmont resident said. "All the stuff they're saying about it being an Airbnb is invented — trying to get people to sympathize with them." But Vixenn is not convinced. According to a recent review of Airbnb listings, Blumberg had five Oakland listings on Airbnb. They range from a "charming, artsy cottage" that rents for $110 per night to a "9+ bedroom, epic historic mansion" that goes for more than $2,000 a night after taxes and fees. As a host he has over 280 reviews. Airbnbs have spread across Oakland at a growth rate of 27 percent per year according to AirDNA, an independent company that analyzes Airbnb data. As of Feb. 9, there are 23 Airbnbs in The Big Blue Haus' Clinton neighborhood, which has had more evictions than any other in Oakland, according to data from The Anti-Eviction Mapping project. The neighborhood experienced 815 evictions between 2005-2016. Oakland does not really regulate short-term rentals. The city enacted short-term rental regulations in 2017 prohibiting rentals on homes and rooms in homes "for less than one week" and banning all short-term rentals for accessory dwelling units. However, a quick search of Airbnb shows how easy it is to find such listings. Indeed, in an email to the Express, Maryann Leshin, deputy director of the city of Oakland's Housing & Community Development Department, wrote, "the city is not currently regulating Airbnbs." This makes housing speculation in a hot Oakland market even more appealing to investors who can use such rentals as a loophole in the Ellis Act. That 1986 state law has long been notoriously difficult for cities to regulate. In Oakland, when a landlord evicts tenants using the Ellis Act, the city places a "Notice of Constraints" on the property. The notice "alerts any prospective buyer of the property and any prospective future tenants of the status." "The problem is that the onus is on the future renter," said Rahman Popal, an associate at Tobener Ravenscroft, a tenants rights law firm in the Bay Area. Instead of the state enforcing the law, future renters are expected to read the notice of constraints and walk away from such units. The city has not confirmed if people who rent through Airbnb would even see such a notice. Joey Colangelo, a managing attorney at the Eviction Defense Center in Oakland, said if a landlord claims they are going to take a property off the rental market, "the only thing a person can do is question if they're being honest about it. The struggle I always have with clients is that the strongest defense you have is in the future." But the future is often too late for tenants. "Even if you have a pretty strong affirmative case where you can sue the landlord, you're almost never gonna get back in there," he said. "You're talking about [suing for] monetary damages but meanwhile the person's life has been uprooted." This is what happened in a recent case across the bay, where San Francisco fined an Airbnb landlord for illegal rentals on an Ellis Act property. The lawsuit settled four years after the eviction, long after the renters — including a disabled tenant — had been forced to leave their rent-controlled homes. When asked what could protect tenants today, Colangelo pointed to the city. "You could try to strengthen the rental ordinance and eviction control ordinance," he said. "What's on the books is easily, and potentially often, abused." The Legislature also could reform the Ellis Act. Meanwhile, the clock is ticking for residents of The Big Blue Haus, who have to be out of the house by the end of September 2019. 8 Pointers for Dating in 2019 Should We Break Up PG&E?